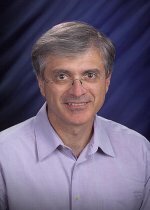 Congratulations to Dr. Tony Janetos for his selection as Pacific Northwest National Laboratory Fellow, receiving the highest rank a PNNL scientist or engineer can attain. Janetos has developed a leadership role in climate science, setting directions for national and international agendas that engage a broad diversity of scientists and decision makers. Recognized for his success in building interdisciplinary research programs, he has proactively designed integrated research programs and activities investigating the interaction of human decisions and ecosystem/environmental processes. Janetos is a prolific author of over 80 book chapters and papers, and has given over 290 invited seminars and presentations on his work. He has been asked to contribute to six National Academy Committee publications and has been a lead author on the Intergovernmental Panel on Climate Change Assessments several times, and has just been asked to author a chapter on the next assessment. As Director of the Joint Global Change Research Institute, a partnership between Pacific Northwest National Laboratory and the University of Maryland, Janetos is frequently called upon to give testimony to Congress and participate in other policy forums to provide scientific insight and perspectives on climate change and its impacts to a wide range of audiences. Janetos is also a Fellow of the American Association for the Advancement of Science.